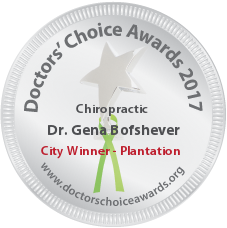 “My mission is to motivate and inspire people to live life to its fullest potential.” With a zest for life as vibrant as her personality, it is no wonder that Dr. Gena Bofshever has become one of South Florida’s most sought-after Chiropractors. An accomplished name in the industry and a 2015 Opencare Patients Choice Winner with a powerful ability to connect with clients on all levels, Dr. Gena prides herself on helping clients commit to a well-rounded, healthy lifestyle. For seven years, she has utilized her passion for prenatal, pediatric, and family wellness care as a driving force behind her mission, and has recently opened her own center, Dr. Gena Chiropractic, in Plantation, Florida, where she thrives on enhancing the lives of others through wellness care and a wonderfully positive attitude. Born and raised on Long Island, New York, Dr. Gena felt a calling to health and wellness from a very early age. Following her graduation from the State University of New York at Binghamton with a Bachelor of Science in Anthropology, she worked as a fitness trainer at a well-known New York health club chain. While she enjoyed assisting clients in reaching physical fitness goals, Dr. Gena knew she had to find a way to heal her clients on a deeper, more meaningful level. 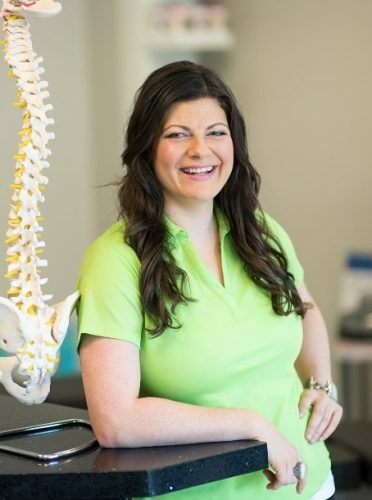 After developing a love for chiropractic care through trusted family members already engaged in the practice, Dr. Gena set her sights on a career in the industry and enrolled in Life University to obtain a Doctorate in Chiropractic. Through the course of her education, Dr. Gena discovered a love for working with pediatric clients as well as expectant mothers. She embarked on post-graduate training to build on her talents for working with young children through the International Chiropractic Pediatric Association (ICPA). To date, Dr. Gena is now one of a select few chiropractors in South Florida certified in the Webster technique, restoring balance to the pelvis ahead of labor and birth. For the first three years following graduation from Life, Dr. Gena further developed her skills at a clinic in Pennsylvania, before moving to Florida to build a business of her own. While in practice in PA, Dr. Gena learned first-hand how to apply the practices of chiropractic care at a high-volume family practice. Now comfortably practicing in a state-of-the-art location, her patients include expecting mothers, newborn babies, children, and an impressive list of wellness clients of all ages. Regardless of age or need, one constant remains the same – Dr. Gena’s adoration and commitment to the individuals and families she serves on a daily basis. Though she tells each patient she sees, “Your health is in your hands, my hands are here to help,” she doesn’t stop there. Dr. Gena enthusiastically educates clients on the Five Pillars for Optimal Health, a holistic view on living that she not only preaches, but practices as well. 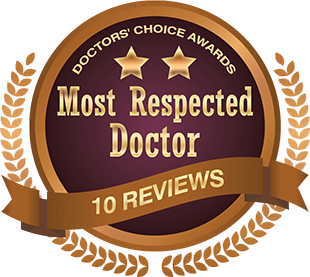 Starting each visit with a positive affirmation and ending with a hug, every client bears witness to Dr. Gena’s absolute-allegiance to their well-being, a practice that no doubt makes her a family favorite, with a radiant spirit to boot. As part of her dedication to a life lived holistically, Dr. Gena firmly believes in paying it forward. She regularly engages in community activities to bring awareness to wellness beliefs and gives of her time to multiple charities. She participated in a mission trip to the Dominican Republic with a group of hundreds of Chiropractors, to provide care to women and children in underprivileged areas. Through her work with the Boys and Girls Club, Dr. Gena was nominated for the 100 Outstanding Women of Broward County award. Additionally, she volunteers for Mothers Against Destructive Decisions (MADD) and the PACE Center for Girls. Recently, she was also a committed planner and participant with Deliver the Dream, which raises money for the families of people with disabilities to be able to engage in fun, stress-relieving health retreats. Dr. Gena rounds out a lifestyle that nourishes her soul as a member on numerous boards, including Femfessionals and The Plantation Chamber of Commerce. Dr. Gena is amazing!! The first time I walked into her office I felt a positive energy instantly. She takes her time with the patients to educate them on the benefits of Chiropractic and their health. She is a giver in her community and always ready to serve!!! Dr. Gena is outstanding! Her understanding of the mechanics of the spine and ability to improve the health of her patients is exemplary. She has a special gift for working with pregnant mothers and helping to improve the health of their babies as well. Dr. Gena is an amazing Doctor!! She cares and gives back so much it is truly inspiring. Her clinical touch is on point yet gentle, her smile is warming and genuine. She is amazing with her “baby Patients” and I trust the care of my 11 month JB with her. We love Dr. Gena’s energy and vision. We are grateful she is a part of our life. Thank you Dr. Gena. Dr. Gena Bofshever uses a ton of her free time spreading the word about chiropractic. She goes above and beyond from a local event booth to a Time’s Square billboard! Above all, she truly cares about each of her patient’s and provides high quality, loving care. Dr Gena is without a doubt one of the best Chiropractors that I know! She not only cares for her practice members, she teaches them about chiropractic and health, and how to live their best lives possible! I would recommend Dr. Gena to anyone looking to create a healthier, happier life for themselves and their families! Dr. Gena takes patient care to new levels. Her energy and enthusiasm radiates to inspire others to be their best. Dr. Gena is awesome! Patient care, staff, office and ambiance, serviceso offered and so much more so provides to the community in excellence. I’m so fortunate to know her and have myself and families as her patients. I can’t say enough about Dr. Gena! Fantastic chiropractor! She has been instrumental in getting me back to work after both a shoulder and ankle injury. And above all, she is an amazing person with terrific energy. Dr. Gena is an outstanding person that puts her whole heart and soul into her work! Gena is smart, passionate and driven. She lights up everyone she is around. I highly recommend her as a chiropractor and speaker. The beautiful thing about Dr. Gena Bofshever is that she cares and loves what she does. It’s apparent- from the moment you walk in the door and she shouts, “Hey Dr. Max” as if I was Norm from Cheers to the hug goodbye she always initiates. She’s thorough, always asking questions as she is manipulating you. Following up on me when I had some pains from CrossFit. She loves what she does. It shows.